I have been meaning to make some macarons for a few weeks now. The instagram posts from Mardi at eat.live.travel.write Tuesday afternoon pushed me over the edge!!! Everyone loves macarons and I suspect this batch will not last long. Raspberry is the flavor of choice this afternoon. A scale. Either a food or postal scale will work. Silicone baking mats or parchment paper. Pastry bag with a round tip. A larger Ziplock bag with the corner cut off will work in a pinch. A stand mixer. You could use an electric hand mixer/beaters though it will make the job a bit more complicated. 120 grams egg whites, divided in half – room temperature. 185 grams granulated sugar, divided into 150 gram and 35 gram portions. Preheat your oven to 330 degrees F. My oven cooks a bit hot so I will double up my cookie sheets to avoid to much heat from the bottom. The goal is to not brown the macarons. Have your pastry bag ready to go with the medium round tip. I like to stand my pastry bag in a tall glass. It helps make filling the pastry bag much easier. Place the almonds and icing sugar in the food processer, pulse until it becomes a fine meal. Transfer to a large mixing bowl and set aside. To one bowl with 60 grams of egg whites add a few drops of the food coloring as well as a few drops of the flavoring you are using and set aside. This will be mixed into the almond meal/sugar mixture shortly. Place the other half of the egg whites – 60 grams in your mixer bowl. Using the whisk attachment place the mixer on around 3. Once the eggs begin to get foamy slowly start adding the 35 grams of sugar. Place the 150 grams of the granulated sugar into a small sauce pan. Add the 50 grams of water to the sugar and place it over medium heat. You will need your candy thermometer at this point of the process. Watch the heat of the sugar, we want to pull it off the heat once it hits 245 degrees F. Be sure you are not touching the bottom of the pot for an accurate read of the temperature. When your sugar mixture hits 245 degrees F take it off the heat, increase the speed of your mixer to high, and slowly pour in the syrup. Beat for 5 minutes. Meanwhile, combine the remaining 60 grams of egg whites with the almond meal/sugar mixture and mix until well combined. Once the meringue is ready, add it to the almond meal/sugar mixture and quickly fold it together. Now you’re ready to fill your piping bag. Pipe 1 1/2 inch mararons onto the silicon baking mat or parchment paper. Leave a bit of room as they will spead just ever so slightly. Let stand for 15 minutes before baking. Gently place into the oven. Do not slide the sheets in as that can cause the macarons with baking with a tilt on one side. In my oven they are done in 10 minutes though you may need to keep them in as long as 12, depending on how your oven bakes. Once done carefully remove the silicone mats or parchment from the cookie sheets and allow to cool completely before removing. Top one macaron with an icing of your choice and sandwhich it with another macaron. I used a simple vanilla buttercream this time though you could really have fun with different flavor combinations. Have fun and remember macarons are a cookie the require practice and patience. Previous Post - Previous post: Recipe To Riches. Canada’s Top 5! Next Post - Next post: A blank slate. It was a challenge to find a recipe that worked so I am thankful this one is no fail! I agree, these are most definitely the diva of all pastries! It is so satisfying to have macaron success. There is noting better then concurring some of these kitchen challenges. Let me know if you give it a try. I think you’ll do great. I tried a few recipes before I had success. 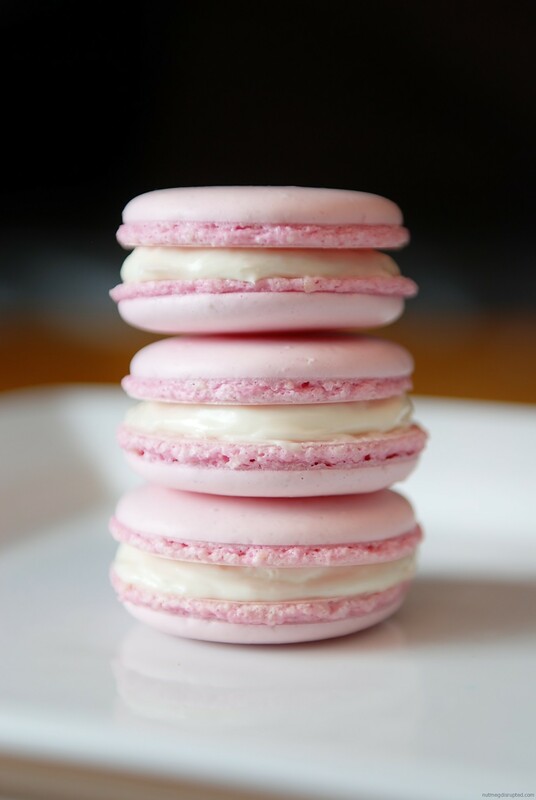 This recipe works for me every time so it is a good one to begin your macaron making journey. Best of luck! You’ll do great! It sure feels awesome to successfully make macarons! Once you make them a few times they are easy to make. Definitely worth giving a try, it is pretty satisfying once you have macaron success. They are a beautiful cookie! Macarons are so pretty, and I love that they’re made with almond meal! I’ve never made them, but I do remember having a couple in a French bakery in the foothills of Colorado, mostly because they were the gluten-free option. I think I’ll try your recipe! Your instructions look good. I have never made macarons, but you have inspired me to try! Let you know how it goes. Practice and patience… I will keep that in mind. Thanks for sharing ? These are so pretty. I’ve always been intimidated by macarons but you break it down so well. I love the pink as well. Reminds me of easter, or a nice rosa! Hi Maureen. The first time I made them was with a different recipe as well. It was a total fail. I love the subtle pink color of the shells, looks so pretty and got me thinking that it’s been far too long since I made macarons! I made macarons once and it was a #fail but this is totally different to the recipe I used. I think this just might work for me. Thanks so much!